The Unlikely Boat Builder: How Big A Boat? One of the eternal questions that every sailor faces is, how big a boat should I own? This makes sense for plastic boat sailors, whose boats are essentially frozen in time, but I think there's a better formula for wooden boat builder/sailors: small enough so that you can improve the boat a bit faster than it deteriorates. This means, not so small that its too easy to keep the boat in pristine condition (what's the fun in that, for a boat builder? ), and not so big that you can't keep up with both basic maintenance and interesting improvements. Thus, optimal boat-size must depend on the owner's time, resources, and skill. Only time will tell if the Blue Moon is the right size boat for Helena and me, but so far, we're doing all right. As I've mentioned in earlier posts, my focus this spring has been on improving and strengthening the BM's running rigging -- the lines (ropes) and other equipment used to control her sails. Among other improvements, I've replaced her motley assortment of old and worn-out lines with new ones. In particular, I have banned all those colored yacht-braids that grated on me all last summer. I know they are strong and popular, but they just don't go with the BM's traditional look. I've replaced them with Hempex -- the best, I think, of the new traditional-look synthetics. 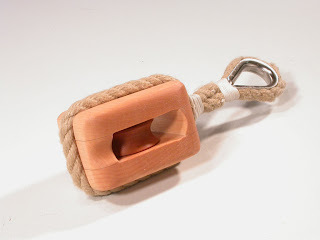 It's strong, feels good in the hand, and is easy to splice. And cheaper! I've also been building blocks to replace the plastic ones that also don't quite fit the BM's look. I should say, I've been learning to build blocks, because block building turns out to require a vast array of skills. 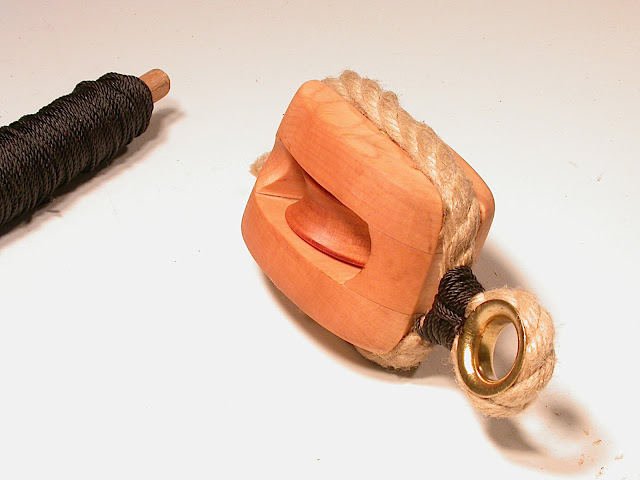 But with some help from the guys on the WoodenBoat Forum, and the amazingly useful Ashley's Book of Knots , I'm gradually 'getting it'. Grommet too long; thimble too big/ugly; seizing all wrong. Grommet seized under tension -- better, but still too long. right size, vastly improved seizing. 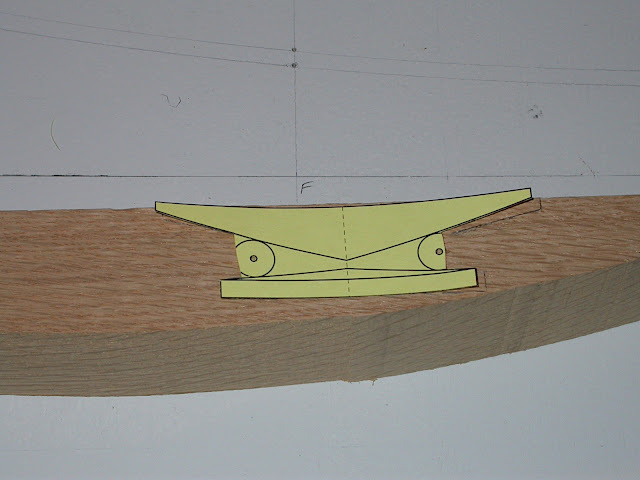 I was happy enough with the 'Mark II' block that I installed it on the BM's deck as my main sheet turning block. I've also been completely replacing the absolutely wretched and dangerous hardware installed on the BM's boom for the outhaul and reefing lines. That re-fit deserves it's own blog post, but I'm so excited about one part of it that I must mention it today: wooden cleats! When I was painting my spars, I removed all the old hardware and vowed not to reinstall any of it. But what to replace it with? 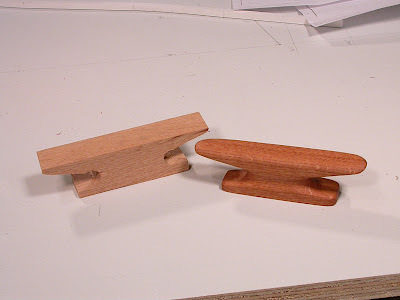 One thing I needed was a boom cleat for the outhaul tackle -- just a short but sturdy cleat that would fit on the boom. I removed an old plastic one that was covered with paint: serviceable but ugly. I looked at bronze ones, but they were a bit pricey. I kept reading that wooden cleats were strong, cheap, and easy to build, so decided to give it a try. I started by making a pattern. I had no idea what I was doing, so just started with some basic shapes. 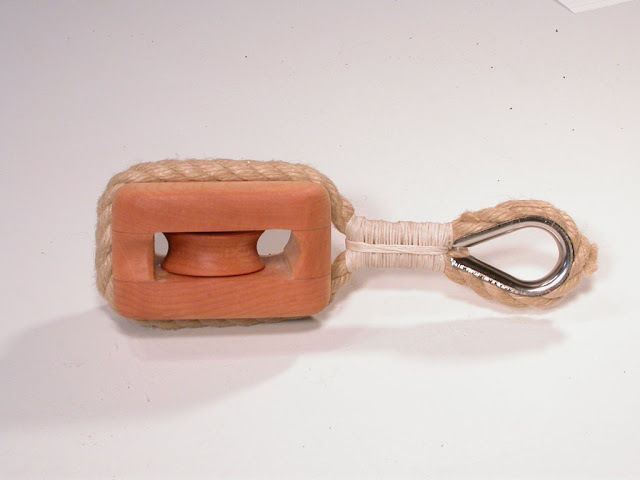 The two circles are 1/2" in diameter -- chosen so that the cleat would be able to handle 3/8" rope with no problem. 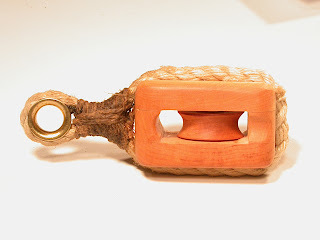 I cut the cleat out of some scrap wood left over from Cabin Boy's stem. I left the circles un-cut-out on the pattern so I could mark the center of the holes, accurately. 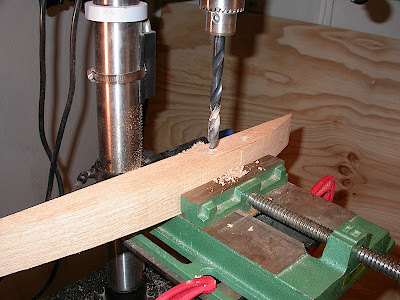 Before cutting out the cleat, I drilled the holes on my incredibly useful drill press. How did I ever live before getting it? After that, it was fairly simple to cut out the pattern on my bandsaw, although it would have been almost as simple to cut it out with a handsaw. 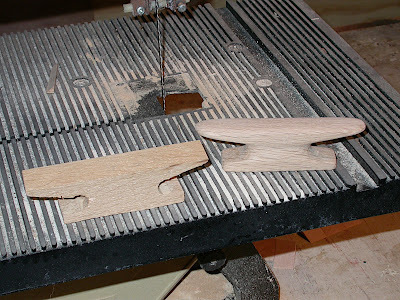 The stock was actually thick enough so that I ended up with two blanks after cutting out the pattern, which is handy. Once the blank was cut out, it was again fairly easy to round the edges with a variety of rasps, including my micro-plane rasps, which I still love. A bit of sanding, and a coat of linseed oil and, voila!, a beautiful looking boom cleat! This cleat was so much fun to make that I've decided to replace all the plastic cleats on the Blue Moon with lovely oak ones. And that's what I mean by 'gradual improvements'. A good collection of "graduals" John. Especially, the Mark II block. Very nice! Allan: good question. I'm trying to decide whether to screw them in, or use bolts that go all the way through the boom. Bob: thanks! I've got some more ideas for the next one, but need to run up to Condon's for some wood, first. Many thanks John for taking so much time and care in your photos. I love your Mk II block! I'd like to give a word of warning about your cleats though. Be careful using wooden cleats where there is a very great load on the line, as they can fail along the grain. I had a wreck caused by failure of a beautiful teak cleat for the main halyard on a dinghy, now replaced by a cheap and serviceable galvanised steel one. Love wooden boat owners formula and maybe add "and have more time sailing it"
as a PS we'd love to feature Blue Moon on 1001 Boats if you have some pictures and words you could send. Max: Funny that you mention the 'more time for sailing' idea. We've been suffering through a fairly miserable spring, alternating between storms and dead calms. One of the surprise benefits of being a builder/sailor is there's always something to do on or with the boat, even if the weather isn't cooperating. Fingers crossed for a Sunday afternoon breeze! Max: oh, and thanks for the invite. I'd love to help raise awareness of Tom Gilmer's lovely little boat. I need to finally get some pictures of her under sail, and then I'll get something to you. Hi. From WBF I came up to your site. I like it. You made your own blocks (so I did) which version 4 is right. Oval and the right thimble. Mine are right now part of my sailing canoe but, I'm building a 19 ft sailboat. It was also good to read ''How big a boat...'' Definitly it should be in accordance of: Budjet, transportation, place to park it (on water and during winter), needs, etc etc. Not trying to make smart by the size only. I keep on reading, regards.